Extract from Bradshaw and Harwood Collieries By James J Francis, pages 25-30. The workings of this colliery eventually covered the wide area on each side of Tottington Road from Riding Gate up to the Harwood boundary with Watling Street at Redman Gate. 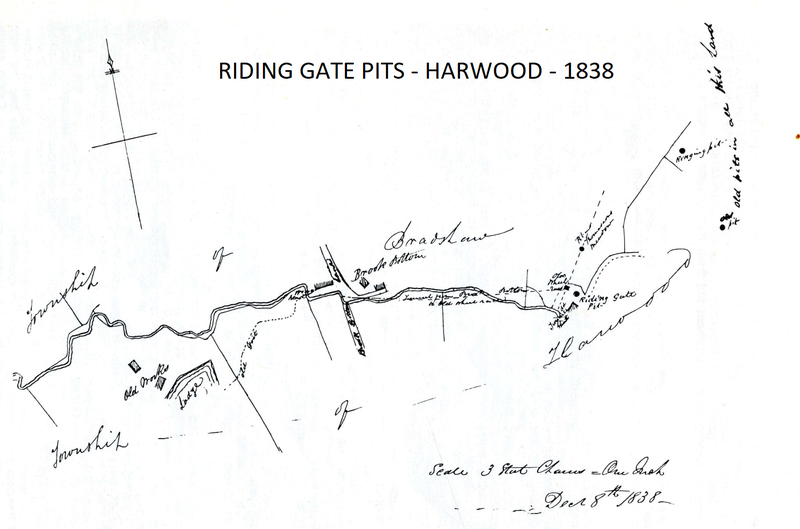 As indicated previously, the earliest pits of Harwood were those workings (possibly bell pits) in the common land alongside Tottington Road adjacent to Old Ned’s and Old Pit, and the deeper pits belonging to Mr. Lever on his Hoyles Fold farm. An interesting plan of March 1828 shows a number of old pits alongside Riding Gate Brook. This plan was in fact the basis of a claim by Abraham Leach, the tenant of Hoyles Fold Farm, against Samuel Scowcroft for the loss of a cow which fell into Mr. Scowcroft’s coal pit known as ‘Ladder Pit’. It is not clear whether the Ladder Pit was in use or not but obviously the shaft was open. There are six other pits marked on the plan, one described as ‘Ancient Pit’ - this ties up with the site of the shaft sunk in 1738 in Hoyles Fold, Fell Meadow in Mr. Lever's property. One other pit is marked as ‘New Pit’, this site will be in the Lower Knotts area of Riding Gate. A plan of Riding Gate area dated 8th December 1838, however, refers to a pit in the same area of the previously named ‘New Pit’ but now ten years later referred to as ‘Old Pit’; and between Riding Gate and Top o’th’ Knotts, a pit in Thomason’s meadow, Riding Gate pit is located in the vicinity of the Greaves with an adjacent square marking the ‘old wheel race’. The curious thing is that a dotted line is marked back against the stream from Brookbottom as ‘tunnel from Brookbottom to old wheelrace’, suggesting that there was an underground waterwheel fed from Riding Gate Brook via a tunnel. An earlier plan of the Knotts estate of the Haslams (c1800) refers to the field below Top o’th’ Knotts as Coal Pit Croft and marks a pit in the garden of Lower Knotts and one adjacent to the Greaves - both properties being in Riding Gate. 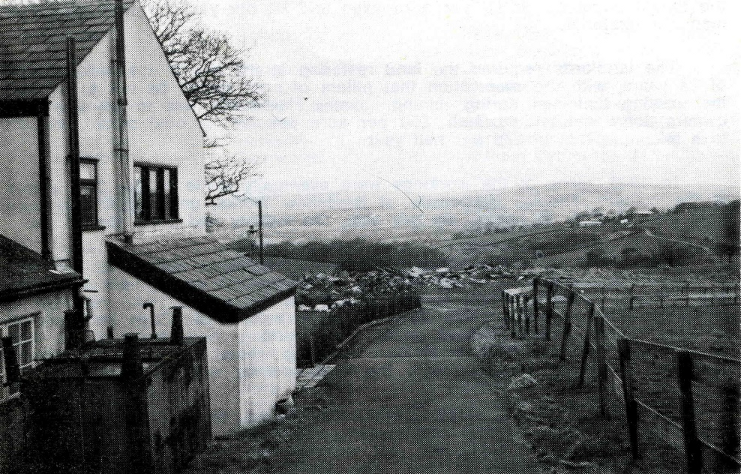 In September 1979, Mr E W Parton was digging in his garden at 59 Riding Gate, Harwood, when he came upon two huge flagstones about 10 feet x 5 feet x 8 inches. Finding the flags covered a very deep hole, he called in the authorities and the National Coal Board when consulted decided to plug and cap the shaft for safety. The National Coal Board team moved the flagstones and uncovered a square shaft measuring 8 feet x 8 feet. The shaft was drystone walled down to bed rock (about 10 feet 6 inches in depth), and the shaft continued through the rock to a depth of 135 feet plus. At 135 feet depth flowing water was reached. At about 50 feet depth, an adit or tunnel of approximately 3 feet square ran westwards to Brookbottom. Mr. Parton's grandfather, Thomas Whittle, who had lived all his life at No. 60 Riding Gate, had often spoken about a shaft nearby with a donkey engine at the bottom of the shaft - although this uncovered shaft was not known to him. Putting these facts together, this shaft could have been the one referred to previously on the plan of 1838, indicating ‘the tunnel from Brookbottom to old Wheel race’. In those days the term ‘engine’ covered any form of power including the waterwheel and this could, in the telling from generation to generation, be converted to the ‘donkey engine’ spoken of by Thomas Whittle. The flowing water at the bottom of the shaft indicates that these Riding Gate pits were connected through to the old Bradshaw Colliery drainage levels which eventually drained off from the Engine Pit tunnel into Bradshaw Brook. 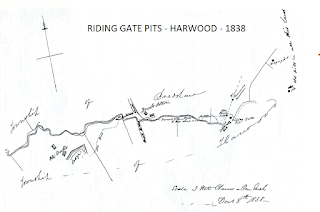 The last pit to be worked in the Harwood Colliery was Hill End or New Pit adjacent to Hill End Farm off Tottington Road, and we are fortunate in havng a complete plan of the workings showing extensive extraction from the Watling Street boundary down to the Riding Gate Pit. rights under Height Barn Farm, Elton - the Heights estate, Harwood, having 60 acres of land - as well as under Higher Barn and other adjacent properties including Old Pit, up to the Hoyles Fold and Old Ned’s boundaries. 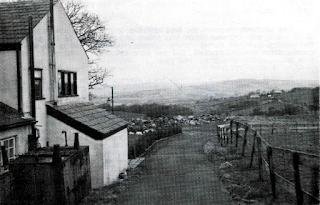 Hardcastle held the lease to take the Affetside or Bradshaw seam of coal of 2 feet 3 inches, with freedom to connect up to existing roadways and drains. He had the right to use old shafts as well as to drive tunnels into the adjoining Castle estate of James Horrocks. He had the right to set up roads, railways, whimsies, cranes, as well as erect coke ovens, but also had to compensate the tenant occupiers at £5 per acre used and £2 per year for free access of men and materials. The landlords required the land restoring at the end of the lease period of 24 years, with the reservation that pillars of coal be left to support the existing buildings during mining. James Hardcastle was to pay the land owners John and William Hall, £50 per acre per foot of coal mined, subject to a minimum rent of £75 per half year. In 1886, plans of the workings were eventually submitted by the then owner of the colliery, Thomas Hardcastle of Bradshaw Works, under much pressure from the Inspector of Mines. By this date, the colliery had been abandoned. The setting up of the Mines Inspectorate had come about from the Earl of Shaftesbury’s enquiry into the working conditions and employment of women and children in mines. The Royal Commission set up in 1840, reported in 1842, revealing even for those days, appalling conditions. Boys and girls of all ages from 8, and sometimes under, were working underground for as long as 16 hours daily, crawling on all-fours dragging loaded tubs or baskets along roadways 30 inches in height with the floor covered with thick mud. As a result of the Royal Commission report, an Act to prohibit the employment of young children and women underground, which passed smoothly through the House of Commons, but encountered fierce opposition in the Lords, was finally enacted in 1842. The Act received a hostile reception in the coalfields from both owners and parents! A Mining Records Office was set up in 1839 by Sir Henry de la Becke, Director of the Geological Survey, but because depositing of plans was on a voluntary basis, the records for earlier years have many gaps. At the same time, it is likely that the mine operators had no proper plans to deposit. In 1844, a Bill for the registration of working plans was read in the House of Commons and approved. Inspectors for the mines were appointed to enforce the legislation, but only one was appointed for the whole of the North West, covering an area including North Wales, Oldham and Burnley, up to Barrow. This impossible task was given to Joseph Dickinson. In 1853, he published a list of all the collieries in his area and the following list is that of the Bolton area alone. Site of Hill End or New Pit, Harwood Colliery, where coal production had ceased by 1868, due to flooding.